The feature fabrics in the medallions are all Kaffe Collective. Well, a couple are so old they are really just Kaffe. Four of the border fabrics, the citron, purple, coral and blue, are blenders from different Tamara Kate collections for Michael Miller. 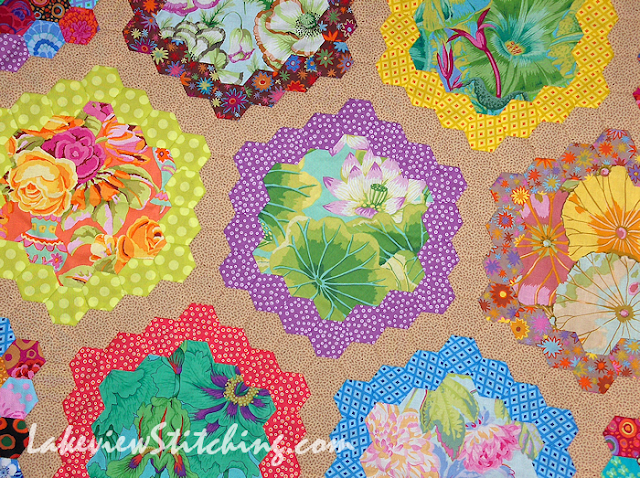 I mention this specifically because they are a perfect match to the Kaffe Collective fabrics! I could not believe it. They must be the same dyes, and the weight of the fabric is perfect too. I bought them for Down in the Garden, but I think a good portion will be going in this quilt. 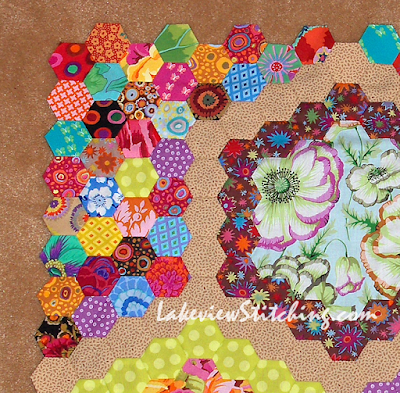 The dark beige "path" hexagons are leftover backing fabric from Hen Party. The fabric is much heavier, but, with the English paper piecing it went together fine. I hoped that the dark beige would make the bright colours glow, and it does! 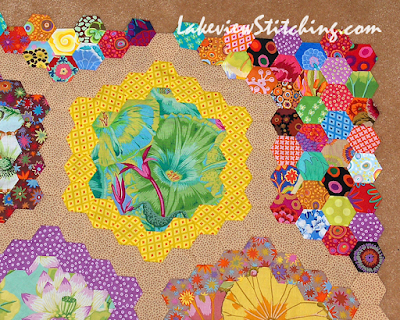 The temptation when fussy cutting those large feature fabrics in each medallion was to put one big flower or leaf in the middle. But I found it was more interesting to have both foreground and background visible in each medallion. It seems to give a lot more depth. The random hexagons that fill in the corners ended up with an overall impression of "red," even though there are not a lot of red fabrics in there. That was pure accident, but I'm very happy with it! You can see that I was able to fussy cut a few of those corner hexagons, but the rest were make-do. All the Kaffe fabrics in the corners are small pieces from the scrap bin. 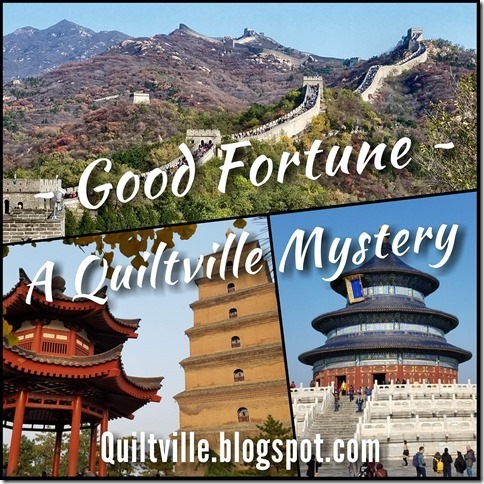 In fact, I was so happy with that motley red effect in the corners, that I started to think about a change in direction for the rest of the quilt. I was going to ask you all for some feedback, but yesterday I came to my senses. I will stick with my plan! Even still, I am deviating from Latimore's design, but I'll talk more about that later. Another surprising match from my stash! But much more on that next time. Now, don't forget to check out the rest of the Slow Sunday Stitchers in the link up right here. Happy stitching! Wow! It's fabulous. Such great colours, fabrics and cutting. I just love those corners. Thanks, Jillian! Those corners were a happy surprise. I'm still trying to figure out how it happened! I have not caught the hex bug, but yours are stunning! I love, love, love this. I'm a big fan of EPP but your Kaffe fabrics (I recognise quite a few of them)just make it pop. 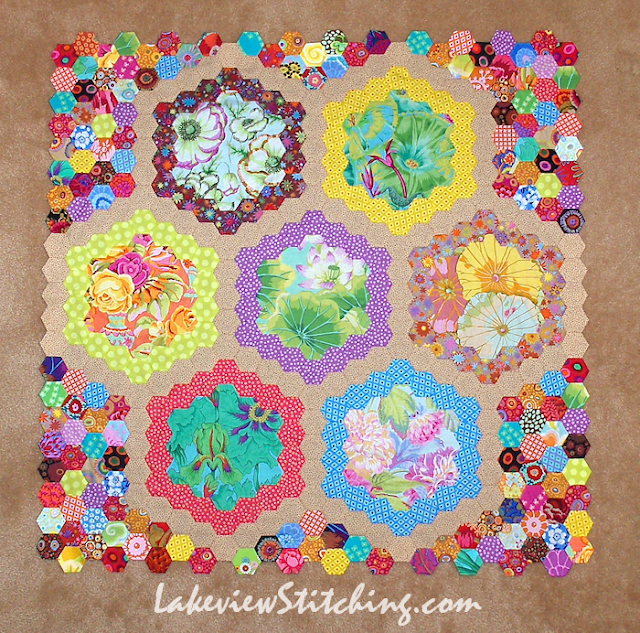 Love Kaffe, love hexies, love Quiltmania. That's a lot of love. Question: for the centers of the medallions, do you just cut a large piece and then applique the hexies on to it? Thanks, Mary Ellen! Yes, that's right. 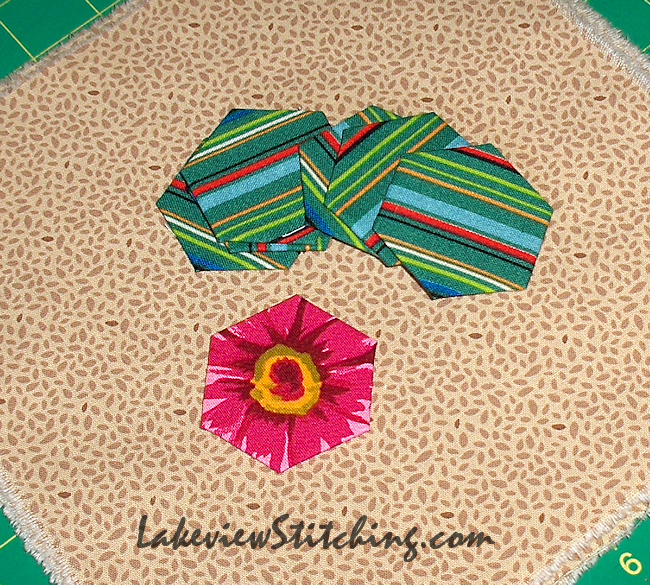 You join the hexies into a ring, and then applique the inside of the ring to the feature fabric. Then cut away the rest. It gives you a chance to find the best composition, within the limits of the size of your fabric. Your Kaffe fabrics really pop with this pattern! I have seen it done in civil war fabrics as well. I will come back to see what you do next. Oh my, this is just beautiful. I love Kaffe fabrics, and having those centers done like that, is perfect. EPP is so relaxing and interesting. I think the corners coming out more red really set it off. If the individual medallions were reddish also the corners wouldn't stand out so much. You're correct in continuing on course as is because it's lovely. 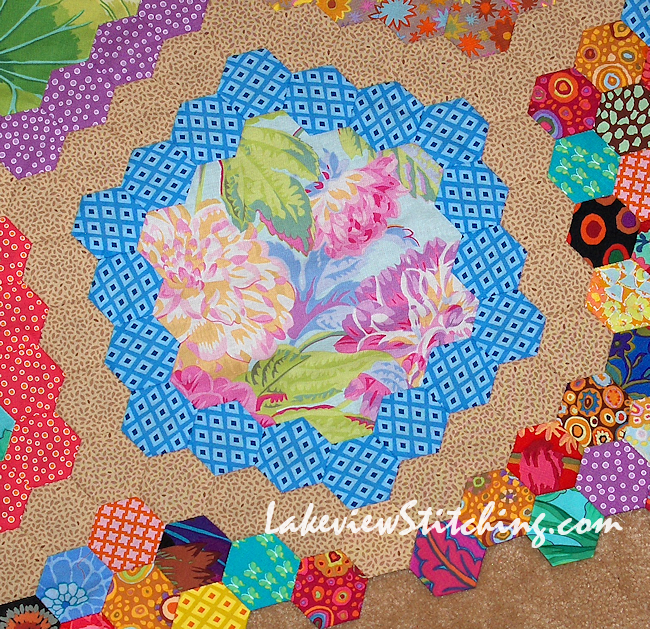 I have a lot of Kaffe fabric to use in The New Hexagon Millefiore quilt along I'm just starting. I know it will be a long term project. I bought both Quiltmania magazines just for Brinton Hall quilt but who knows when I will get started. I do enjoy EPP. Your quilt centre is just beautiful!!! Love it!! WOW! 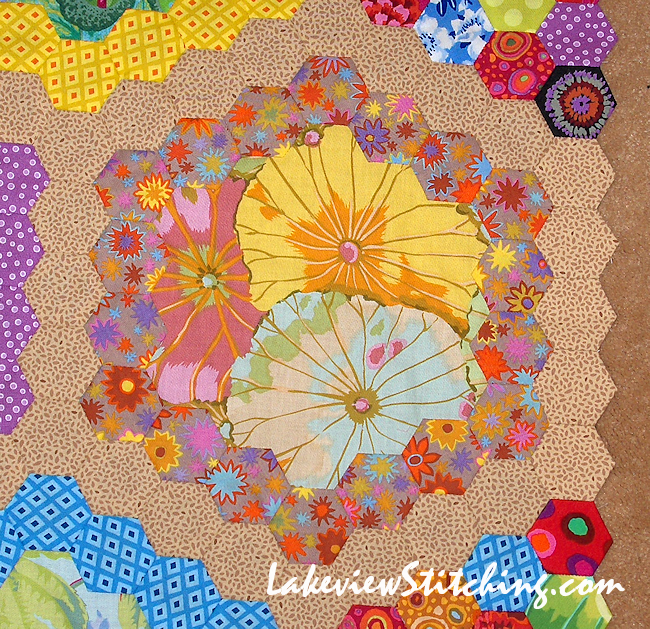 I love this look for a quilt with beautiful medallion fabric with hexies around it. Your fabrics and colors are to die for. and your arrangement is just stunning! This is looking amazing with all that lovely Kaffe colour! 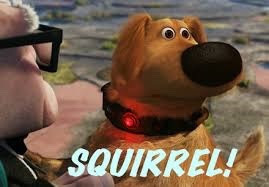 My goodness, you are so busy! 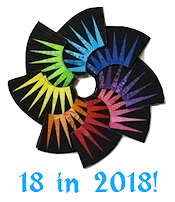 The colors are bright and beautiful, and I'm looking forward to seeing the rest of the quilt. Thanks, Terry! It's been fun and easy to do, and I've had no problem sticking with it. I guess that's due to all the fun fabrics. Now, though, I have to hunt through my stash for the next bits. 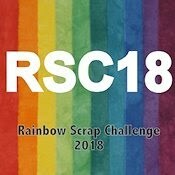 Let's hope I can find the fabric I'm looking for! 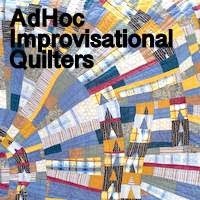 Wow, that quilt has a whole love of pretty fabrics. I can't wait to see how you progress. Your top just goes to prove that hexies look great no matter fabrics you use. Such a lovely looking quilt with all those hexagons and wonderful colours all so beautifully laid out and quilted. I've seen several versions of Brinton Hall out there in blog land. Yours is one of the best! I'm with Kyle - hexies look good in whatever fabric you chose! Everyone should have some Kaffe fabrics in the stash - such happy, happy colours!